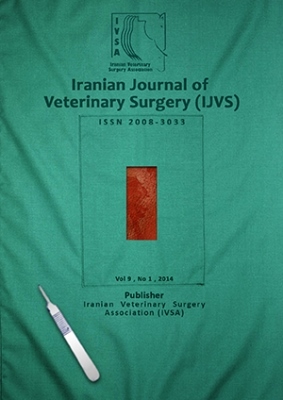 Iranian Journal of Veterinary Surgery (Iran J Vet Surg [IJVS]) is the official publication of the Iranian Veterinary Surgery Association (IVSA), published biannually (2 issues per year). The journal aims to provide a groundwork for the contribution of Iranian and International researchers and practitioners in the field of veterinary surgery and its related fields. This Journal is indexed by CAB International, Veterinary Bulletin, Index Veterinarius, Index Copernicus, Magiran, Google Scholar, Iran Ministry of Science Research and Technology, Scientific Information Database (SID), and Islamic World Science Citation Center (ISC).